To make a model that would be an exact reproduction of a battleship, you would not only have to possess a set of scale drawings of the ship, but an abundance of patience, and a willingness to devote lots of time to the work. The author would be glad if you could make an exact model because he knows that you would get a great deal of enjoyment and practical experience out of the work, but he suggests that your first model be simple. You can elaborate upon a second model as much as you please. 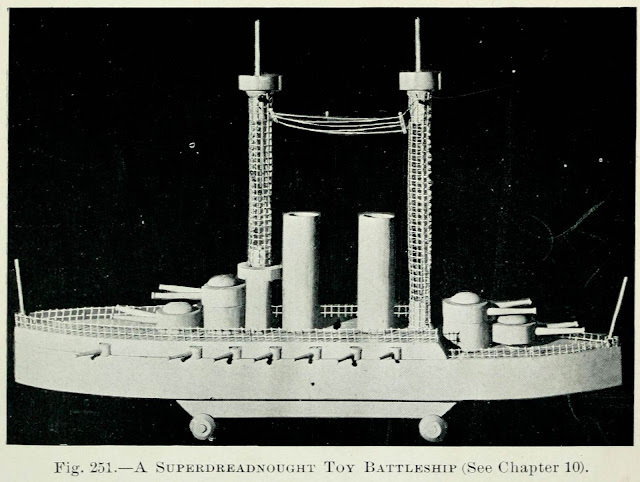 The way to make a simplified model of a battleship, building, piece of machinery, or any other structure, is to get a picture of it, or to look upon the object itself, and pick out the half dozen or so parts which determine its contour; then reproduce these parts in as nearly the correct proportion as you can. Take the author's model, shown in the photograph of Fig. 251, for example. The essential parts are not many. They are the hull, deck, masts, funnels, main-battery guns and turrets, and the secondary-battery guns below the deck. The deck-rails, fighting-tops, and wireless aerial might be omitted without destroying the lines which give the ship its form. Details other than those shown upon the model illustrated can be added if you wish to spend more time upon the work. The best material for model making is white pine, but cypress, spruce, or any other soft wood, will serve the purpose. For the hull of the battleship model shown in Fig. 251 a piece of 2 by 4 is of the right width and thickness. The funnels, turrets, and fighting-tops also can be cut out of a 2 by 4. A board 5/8 inch thick is required for the superstructure-deck. The masts require a narrow strip of wire cloth with 1/4 inch mesh, and four spools. 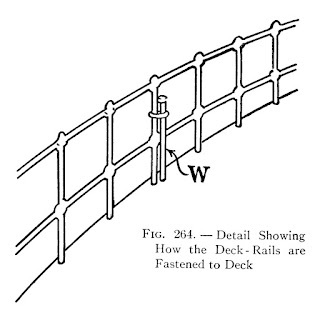 The deck rails are also made of wire cloth. Spools are used for wheels to mount the model on. The guns are cut from dowel-sticks 1/8 inch and 1/4 inch in diameter, the small gun mounts are cut from a 3/8-inch dowel-stick. The pins connecting the various parts are cut from 1/4 inch dowel-sticks. Button-moulds 1 1/4 inches in diameter fit over the ends of the gun turret pivots. with all of the dimensions necessary for cutting it out. Figure 253 shows the completed hull. The curves of the ends should be alike, and the best way to get them alike is to draw a center-line lengthwise, and another center-line crosswise of the block; then mark out one-half of the outline of one side, drawing the straight line with a ruler, the curved line freehand. Trace this much upon tissue-paper, reverse the paper, and transfer the line each side of the center-lines, to complete the outline. First, cut out the block roughly with a saw, then finish up close to the outline with a plane, and sandpaper the edges smooth. The Superstructure-Deck (B, Figs. 254 and 255) may be marked out by placing the hull block upon a board 5/8 inch thick and marking out around its sides. The deck piece is a trifle more than two-thirds of the length of the hull. The dimensions are on the diagrams (Fig. 254). Openings for the guns must be cut in the deck piece along the side edges. The openings are made by boring ½ inch holes 1/2 inch deep (Figs. 251 and 255). They are located in Fig. 254. The centers are placed 1/8 inch inside of the edges so that brads can be driven through the centers for pivots for the guns. Bore the holes before cutting out piece B, so there will be no danger of splitting the edges. Be careful to bore all holes of equal depth. will look better if bored out for a depth of 1/2 inch or so (Fig. 255). Bore the holes before rounding the block the funnels are to be cut out of, to prevent splitting. The funnels are fastened to the deck with dowel-pins D (Fig. 255). Bore the pin holes in the deck where located in Fig. 254, and in the center of the funnel ends. Coat the dowel-pins and funnel ends with glue, before driving the dowel-pins into the holes. The Conning-Tower, by cutting away a section of each side, as shown in Fig. 255. Peg this block to the deck with a dowel-pin driven into a hole bored at the point located in Fig. 254.
out of slender sticks, and use black thread for the wire strands ( U). Fighting-Tops K are fastened to mast spools / by means of dowel-pins L, which are driven into the spool holes. The Turret Bases and Turrets. Holes must be bored through the center of turret blocks N, turret base blocks M, and into the decks (Figs. 251, 253 and 255), for dowel-pin pivots P to run through. These holes are located in Figs.252 and 254. Make the pivots out of ¼ inch dowel-sticks, or whittle sticks to this diameter. Glue the lower ends of the pivots in the holes bored in the decks, whittle the upper ends to fit the holes in button-moulds measuring 1 1/4 inches in diameter (Q, Fig. 255), and glue the button-moulds to the pivot ends after the turret base blocks and turret blocks have been slipped over the pivots. Holes must be bored in the side of the turret blocks for the guns to run into. To lessen the danger of splitting the blocks while boring, it is best to bore the holes before sawing the blocks from the stick from which they are cut. Figure 257 shows the location of the holes. 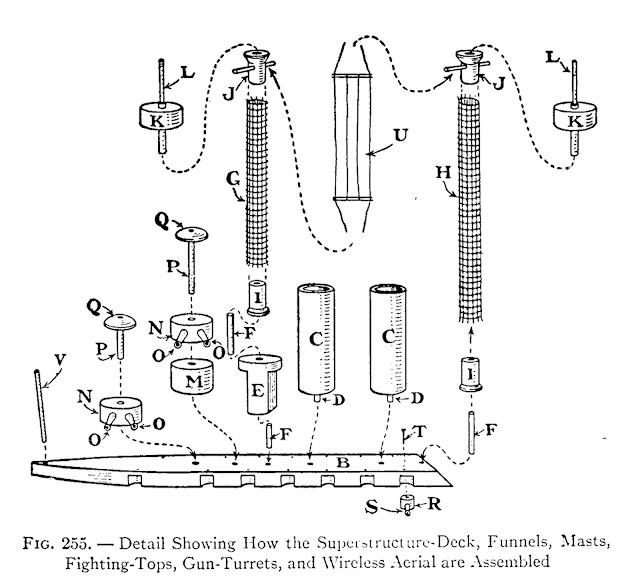 The Main Battery Guns (0, Fig. 255), mounted in the turrets, are shown in detail in Fig. 259. Take a 34-inch dowel-stick, or a stick whittled to this diameter, and cut from it eight pieces of the length shown (Fig. 261), then with a small wood-bit or drill, start a hole for the bore in the muzzle end of the guns, and with a jack-knife carefully taper the guns from end to end, as shown in Fig. 259. Smooth up the guns with sandpaper. Glue them in the holes in the turret blocks. The Secondary-Battery Guns are mounted in the round blocks R (Fig. 255). Cut fourteen of the blocks from a 3/8-inch dowel-stick (Fig. 262). With a small bit or drill make a pivot hole through the center of the ends of each block, and another hole in the side of the block to run the gun into. Prepare the guns of the shape shown in Fig. 260. Cut them from a dowel-stick 1/8 inch in diameter (Fig. 263). Start a hole in the muzzle end of each gun for the bore. The Flagstaffs (V, Fig. 255) are 3 inches long. Drill holes for them at the bow and stern of the decks. 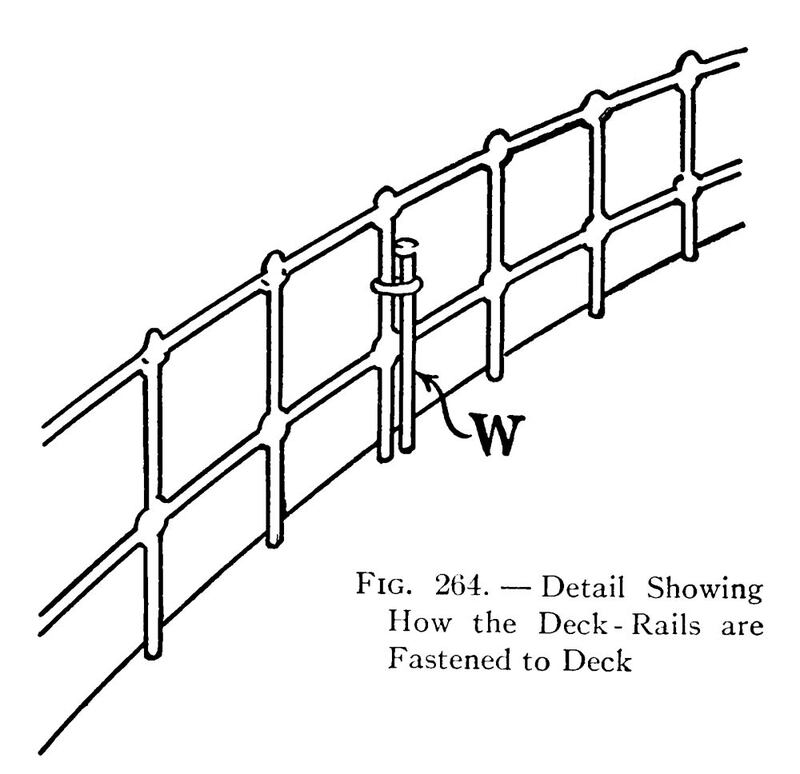 The Deck-Rails are made of strips of wire cloth. Cut two strips 1/2 inch wide, one for the superstructure deck, the other for the lower deck. 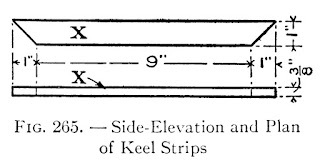 Drive 3/4-inch brads into the decks close to the sides (W, Fig. 264), bend the wire strips around the brads, and with wire bind them to the brads. A Running-Gear, your toy battleship will both float upon water and run upon land. 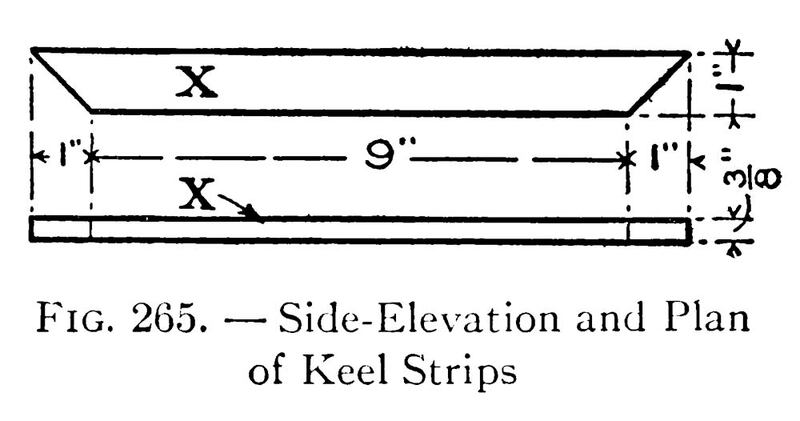 Cut off the ends of a pair of spools for wheels (Y, Fig. 267), and fit 1/4-inch dowel-sticks into them for axles (Z). With all work done as directed, the dreadnought will be ready for its coat of battleship - grey. The author suggests that you paint all the parts before assembling. It will be easier, and the parts can be allowed to become thoroughly dry before they are assembled, which will prevent the sticking of such pivoted parts as the gun-turrets and rapid-fire gun mounts. Surfaces marred while Assembling can be touched up afterward. There is not much work to put the model together when all parts have been properly fitted. In mounting the secondary battery guns, slip the fourteen-gun mounts into the holes bored in the deck piece, then nail the deck piece to the hull, and drive brad pivots down through the deck and gun mounts, into the hull. Figure 255 indicates very plainly where the funnels, masts and other parts go, and fastening them in place is for the most part simply a job of gluing.